Room For Everyone! This nearly 3,000 sq ft home has lots of special features! Enjoy the updated kitchen with beautifully painted cabinets, stainless steel appliances, gorgeous lighting and ceramic tile floors. The fridge stays! Serve your guests in the separate dining room with crown molding details. Relax in the hearth room with a brick wood-burning fireplace and huge bay window. Finished lower level is a crowd pleaser, featuring a stone front wet bar, built-in shelving and full bathroom. Great entertainment space! Pamper yourself in the generous master suite with a large walk-in closet and a full bath with a corner soaker tub and separate shower. Three spare bedrooms with large closets, a full bath and a versatile loft complete the second floor. Level back yard has a deck with metal detailed railing perfect for BBQ's. Oversized garage workshop/hobby/storage area. 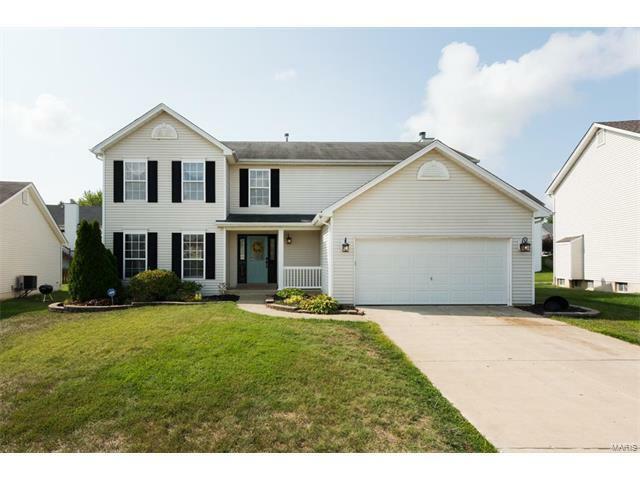 Walking distance to all 3 Fort Zumwalt schools. Neighborhood pool. So much to love! See it today! I-70 to TR Hughes Blvd, South toward Belleau Creek Road which becomes Knaust Road to Left on Lunenburg Drive. Take first left to stay on Lunenburg Drive. House is on the Left.